"Disgustingly normal" is the way one of Blaine County educator Carla Scanlon's close friends describes her. And that suits Scanlon just fine. Despite her impressive credentials—teacher, mother, mentor, wife, grandmother, church leader and tireless volunteer, to name a few—Scanlon is someone with whom you feel you could easily share confidences and compare notes with over lunch. Someone normal. But Scanlon is probably too busy to meet you for lunch. She arrives at either Hailey Elementary School or Woodside Elementary School by 7 a.m. each day to start her day as a cognitive coach for the school system. She is always among the last to leave at day's end. Throughout, her demeanor remains unhurried and authentic, as though whatever she's doing at that moment is the most important thing to do all day. Her current job is one of helping teachers teach effectively, but she remains a classroom teacher at heart. During a recent tour of her longtime home school, Hailey Elementary, Scanlon beamed as she admired each grade's artwork, and explained the significance of the special "sign posts" at the corner of each hallway encouraging children to be their best. She greeted every student and teacher she passed with a warm smile, showcasing her deep dimples. With controversy and debate swirling over the state of education in both the state and the nation, Scanlon is staying her course. At 60 years old, with about 20 years of teaching under her belt, Scanlon puts it simply: "I am doing the same things all the women in my life are doing. I want to do the best for my kids, my family, my students, my community." What isn't so "normal" about Scanlon is her drive, her energy and her obviously keen mind. "I'm not wicked smart," she laughed, a hint of her Lava Hot Springs past seeping through in just the slightest accent. Nonetheless, she is wicked dedicated. Without needing an alarm clock, she rises at 5 a.m. each day. "The excitement and eagerness to see what the day will bring often wakes me early," she said. In her tidy office on the lower level of Hailey Elementary, her two passions—family and education—are readily apparent. Her bookshelves are lined with both family pictures and countless books. Two signs hang on the walls. One says, "Let the wonder never cease." The second, "He who gives money gives much. He who gives time gives more. He who gives himself gives all." And Scanlon gives her all, every day. While the world changes around her, Scanlon is determined to keep up and help students get what they need. With constantly evolving technology, she enjoys what she calls the aggressive learning scale. The data-driven world keeps her smart, young and on her toes. "I have to run faster than the kids, which often means having to run really fast," she said. Staying ahead of the curve is one thing that keeps her up at night. "Many nights I find that I am so eager to do what is on the schedule for the next day that I am wakeful in anticipation. Also, when I can't solve a problem, I cannot shut off my brain." Worries for some of "her" children and families also keep her up. "No matter how I much I care, I cannot change some life experiences for children in our community," she said. But the state of education in Idaho doesn't interrupt her sleep. "I have a sense we're going to be fine," she said. "I find peace and comfort that I live exactly where I live and when I live. In the past and right now, Blaine County offers outstanding opportunities to all students and educators. We have the most supportive community of learners that I have ever encountered. I find comfort that even in tense economic times, students and teachers who are fortunate enough to live here will still find what few in the world have an opportunity to experience." Many of us remember a special teacher who changed our lives, set us off in a new direction and nurtured our dreams. For countless children in the Wood River Valley, Scanlon has been this teacher. Lauren Morgenthaler, now an honor student at Oregon State University, wrote an essay about "Mrs. Scanlon." 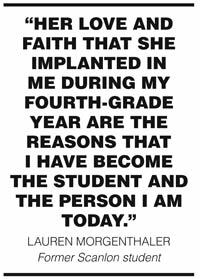 "Her love and faith that she implanted in me during my fourth-grade year are the reasons that I have become the student and the person I am today. Mrs. Scanlon taught me how to find pleasure in literature, solve problems and believe in myself. By example, Mrs. Scanlon instilled in me a passion for learning which I have carried throughout my education and will continue to apply for the rest of my life." Scanlon graduated with a teaching degree from Idaho State University but was content using her skills on her own children until 20 years ago, when her then-12-year-old daughter invited her to teach at her school. "It seemed like a huge challenge, as I had six children at home, ages 2 through 16," she said. "That decision turned into an amazing family experience." During her time as a classroom teacher, Scanlon spearheaded Blaine County after-school programs and wrote district and state curriculum and state math assessments. She also did other, less glamorous things, like make sure that all the children at Woodside had the equipment necessary to participate in the ski program. Scanlon is full of fond memories of the those years, which ended three years ago with a job change. She is giddy remembering the year she taught a bright class of fourth-grade math students. "It was just amazing!" she said. But her new job, as cognitive coach, seems equally suited to her skills and temperament, and one in which she can be a great asset to both Hailey Elementary and Woodside Elementary. As a "teacher on special assignment," she helps teachers teach. According to Scanlon, while other Idaho school districts have reading coaches, instructional coaches and math coaches, only Blaine County employs a cognitive coach. She credits former school Superintendent Dr. Jim Lewis with the foresight. "He realized that in order to have a larger impact on teachers in every facet of education, cognitive coaches would not be restricted to, or by, subject area," she said. In this capacity, Scanlon is a sounding board and fact finder, liaison and ruffled-feathers smoother. Within a day, she may work with a teacher who is not sure how to use a Promethean Board (a high-tech version of the chalkboard) by putting the teacher in touch with the right person who can help him get up to speed with the latest technology. Later, she might be sitting with a parent who is having trouble with a teacher. Scanlon will work as a go-between, often facilitating a solution before the conflict gathers more momentum. As a curriculum specialist, she also implemented instruction materials, resources and lesson plans, helping teachers keep up with ever-changing standards and assessments. Much of her time is still spent in the classroom, observing teachers and students, modeling lessons and giving feedback. Mostly, she keeps her finger on the pulse of what is going on at the schools. "For both teachers and parents, I can honestly look them in the eyes and say, 'I've been there. I know exactly what you're saying,'" Scanlon said. While Scanlon has been in the education field for more than two decades, she's been in the parenting trenches for more than three. There is little about raising children that she and husband Owen haven't seen first-hand. As youngest daughter Jordan said, her mom "can be heard to say that teaching is so close to parenting that sometimes she can't separate the two." Those who know Scanlon say her positive attitude is her greatest asset. According to son Cade, "My mother is the most optimistic person I know. She always sees the potential buried within everyone. She goes above and beyond to ensure that her students have success. Tutoring begins daily before school, continues through recess and lunch hours. Phone calls home happen at family meals and even on vacations." She has, in the past, become so attached to students that she has intervened on their behalf. Twice, Scanlon actually started the legal process to become a foster parent to students in need. She once offered to have a student live with her until the end of his fourth-grade year after his father was deported to Mexico. Karen Gedde, a colleague who nominated Scanlon for Woman of the Year, called her an amazing woman, mentor and dear friend. "I have come to realize it is impossible not to admire, to like and to respect her," Gedde said. "Her devotion and advocacy for children—anyone in need for that matter—is above and beyond the call of duty. She quietly performs acts of kindness that would often appear large and overwhelming. She inspires me to strive to be my best." Scanlon's passion for teaching is second only to her passion for her children, her husband, her nearly 90-year-old mother and six grandchildren. Forty years into a marriage to Owen, Scanlon's admiration for him is steadfast, calling her college sweetheart "an incredible husband, father, brother, son and neighbor who has time for anyone in need." Community service trickles through the Scanlon brood. "One time four Scanlons were all donating blood at the same time," recalled daughter Jordan. "Not one of us knew the other had plans to donate that day." The family checks in every night with their parents and with each other. "When one of the kids calls home, I always ask, 'who have you talked to today?'" said Scanlon with a laugh. When she is not at school or with family, Scanlon continues to volunteer her time and energy. Her involvement with the Sun Valley Ward of the LDS Church is an important part of her life. Currently, she is in charge of spiritual teachings for children 18 months to 12 years old. "My mom is relentless in serving others because she feels that she has been abundantly blessed," Jordan said. "And we are blessed to have an educator like Carla Scanlon fighting the tireless fight for our children." Scanlon wants to stay in the fight for a long time. "I hope to work until I'm really old," she said.